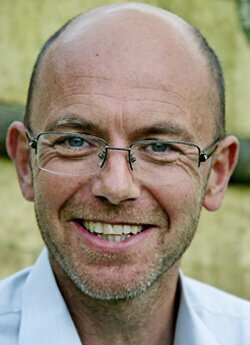 Wayne Hemingway MBE is an award-winning designer and co-founder of Red or Dead. Wayne was born in 1961 in the seaside town, Morecambe. Maybe not the most appropriate surroundings for one of Britain’s most acclaimed designers, but then Wayne has never been very appropriate anyway! After spending most of his childhood in Blackburn, Hemingway left school with 10 O’Levels and 4 A’Levels. In 1979 he went on to undertake another ‘inappropriate’ move for a future fashion designer by gaining a Degree in Geography and Town Planning at University College, London. One day he decided to empty his wardrobe and that of his childhood sweetheart (now wife Gerardine) and took the contents to sell on Camden Market. The realisation that money could be made from fashion suddenly dawned. Along with Gerardine, Wayne built Red or Dead into a label that received global acclaim resulting in winning the prestigious British Fashion Council’s Streetstyle Designer of the Year Award for an unprecedented 3 consecutive years in 1996, 1997 and 1998. After 21 consecutive seasons on the catwalk at London Fashion Week, Wayne and Gerardine Hemingway sold Red or Dead in a multi-million cash sale. In 1999, having sold Red or Dead the Hemingway’s set up HemingwayDesign, which specialises in affordable and social design. Over the past two decades, Wayne and his team have delivered several high-profile, award-winning, affordable new-build housing schemes. They’ve ‘turned around’ troubled estates and have a string of impactful seaside regeneration projects under their belts. Furthermore, they have extensive worldwide knowledge of creative led regeneration, great urban design and architecture. Wayne was the chairman of the place-making campaigning body Building For Life for eight years. He also sits on the Trustee Board of CABE (Commission for Architecture and Built Environment). Described by many as the most ambitious and coolest festival start-up ever, The Vintage Festival was started after Wayne spotted an opportunity in the market. Subsequently, he set about designing and delivering a summer festival for 50,000 people from scratch. The assembly of the team of designers, collaborators, bands, artists and designers, volunteers, plus the viral and street-led campaign, is an amazing and visually stunning chain of events, full of disasters and triumphs. Vintage is now an internationally recognised brand with many interesting spin-offs. With a career spanning four decades in the design industry, Wayne Hemingway has a fair few stories to tell and lessons to give. His talks are insightful, thought-provoking, inspiring, often hilarious and always truthful. As well as keynote speeches, Wayne also hosts conferences and award ceremonies.